When it comes to social media you’ve got so many different types of users. You have people who apply filters to cheap food, entrepreneurs sharing the latest SEO ‘tips and tricks’, and your Grandma replying to a comment in a status update. When it comes to Twitter, some people obsess over their perceived ‘klout’ and want to track the number of followers and other statistics. 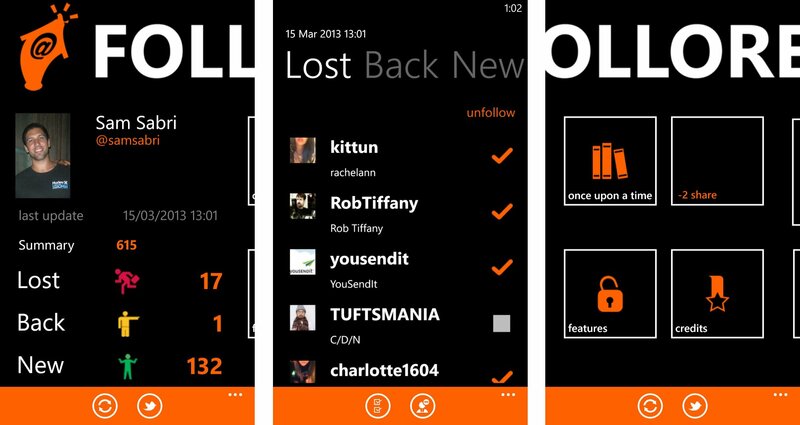 Follorep is a Windows Phone app that helps you keep track of some of those Twitter stats. We were hoping to tell you guys about Follorep a handful of weeks back, but it was still rough around the edges. The developer recently put out an update that makes it a nice recommendation for Twitter users. There are a few things that need to be addressed, but it’s not bad at all, especially for the price. Follorep is at its heart, an app that helps you track the number of followers you gain, lose, or regain overtime. When you first launch Follorep you’ll sign in with your Twitter account and give the app permission to read and write on behalf of you. This comes in handy and you’ll see why. From there you’ll run an analysis to get an initial count of everything – followers gained, lost, and regained. If it’s your first time using Follorep you probably won’t see anything because the app has tracked you before. Anytime you run an additional analysis you’ll see the changes if you have any. If you click on lost, back, or new you’ll be given a list of all the Twitter users who have followed or unfollowed you. From there with one tap you can chose to follow them or unfollow them. It’s a nice way to clean up your Twitter timeline in a fairly fast interface. So Follorep is free with no ads. How you ‘pay’ for the app is basically by sharing Twitter statuses within the app. Doing it ‘x’ number of times will unlock certain features within the app. For example, there is a graph that will chart your Twitter followers over time. You won’t have access to it at first, but if you ‘share’ enough times you’ll get access to it and other features within the app like ‘once upon a time’ and ‘fast unfollow’. It can be annoying and you might consider it spamming your Twitter feed, but it’s hard to complain when you’re using a free app and can easily delete those tweets later if you want. If you’re a diehard Twitter user or happen to keep a close watch on your followers/following lists you’ll want to check out Follorep. There are a few places within the app that need a little more tweaking. For example there are some dates that visually overlap in the ‘once upon a time’ section, but nothing major that detract from what Follorep does. You can download Follorep for both Windows Phone 7.x and 8 right here in the Windows Phone Store, use the QR code below, or swipe to the right in our Windows Phone Central app. P.S. 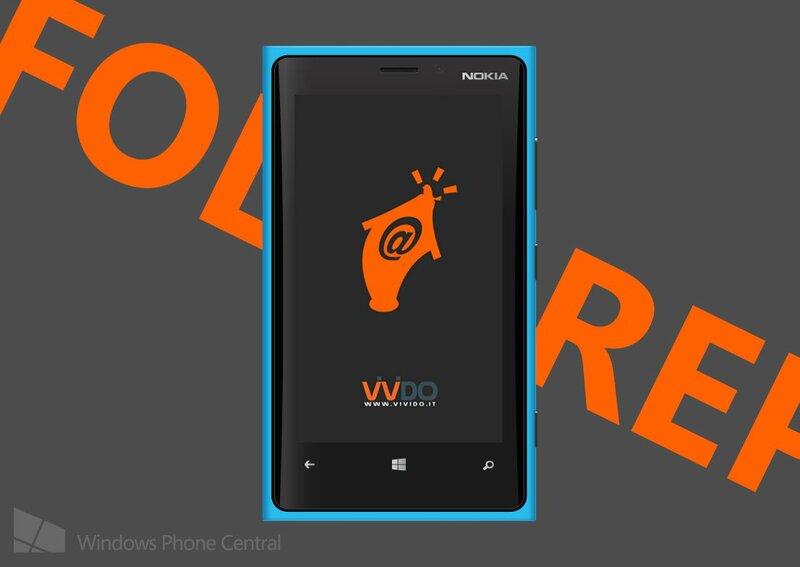 Since this is a Twitter app I'm going to remind you to follow the Windows Phone Central team. You can get our official account @wpcentral, Daniel Rubino is @Daniel_Rubino, Jay Bennett is @JayTBennett, Rich Edmonds is @RichEdmonds, George Ponder is @Coppertop004, Paul Acevedo is @segacon, Dave Blake is @Big_D5, and yours truly is over at @samsabri.